Sony Memory Card File Rescue Recovery allows you to recover files that have been accidentally or unintentionally destroyed or deleted from Sony Memory Card media or Sony Micro Vault USB storage drives.Sony Memory Card File Rescue Recovery supports recovery of JPG (DCF), MPEG-1, MP4 (MPEG-4 and MPEG-4 AVC), AVCHD (ver2.0) file, AVCHD3D, 3D photo (MPO), RAW photo, MOV movie and other types of data files. 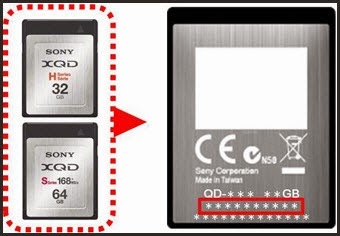 Sony Memory Card File Rescue recovery download process requires authentication of the serial number and model number listed on your Micro Vault flash drive or Memory Card media. Please have your Micro Vault flash drive or Memory Card media available. How to get your flash drive or memory card serial number ? 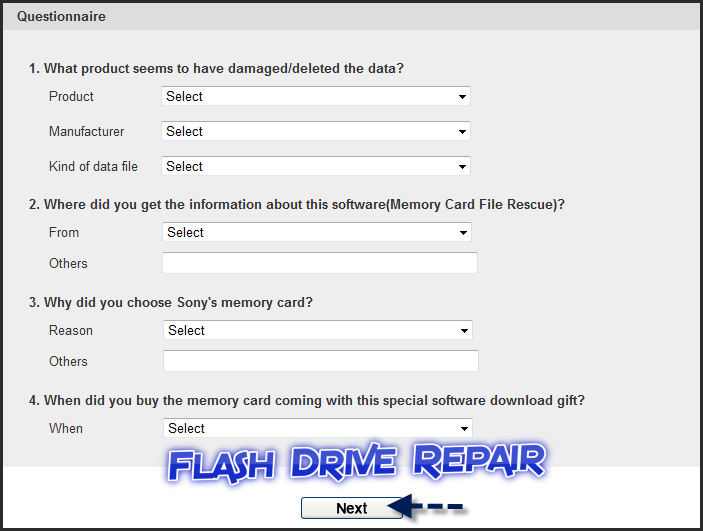 Open this link "Sony Memory Card File Rescue " to fill out the flash or memory details and download your Correct flash software . To ensure that no other program interferes with the installation, save all work and close all other programs. The Task bar should be clear of applications before proceeding. At the Memory Card File Rescue download page, fill in the fields for the "Model name" and "Serial number or downloading code". Note: Be sure to include the hyphen in the model name. Please complete the optional Questionnaire, and then click the "Next" button at the bottom of the page. At the verification page, verify that the information is correct and then click the "OK" button to continue. At the Software Download page, click the "Download" button. In the "File Download" window click the Save button to download the MCFileRescue.exe file to a temporary or download directory (please note this directory for reference). Go to the directory where the file was downloaded and double-click the MCFileRescue.exe file to begin the installation. If a security window opens, click Run or Continue. At the "Welcome to the Install Shield Wizard for Memory Card File Rescue" screen, click the "Next" button to continue. At the "License Agreement" dialog, read the agreement, then, if you agree, select "I accept the terms of the license agreement", and then click "Next" to continue with the installation. At the "Ready to Install the Program" window, click "Install". At the "Install Shield Wizard Complete" window, click the "Finish" button. 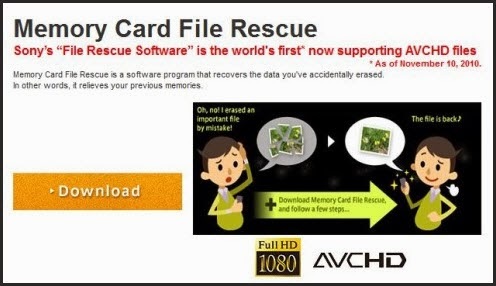 For further Details please visit this article from the Sony Official Site "Sony Memory Card File Rescue"
Simply want to say your article is as amazing. The clarity in your post is just cool and i can assume you're an expert on this subject. I was currently looking for similar sort of tool, for the past few days. The other similar sort of tool that I found reliable was Remo Recover.